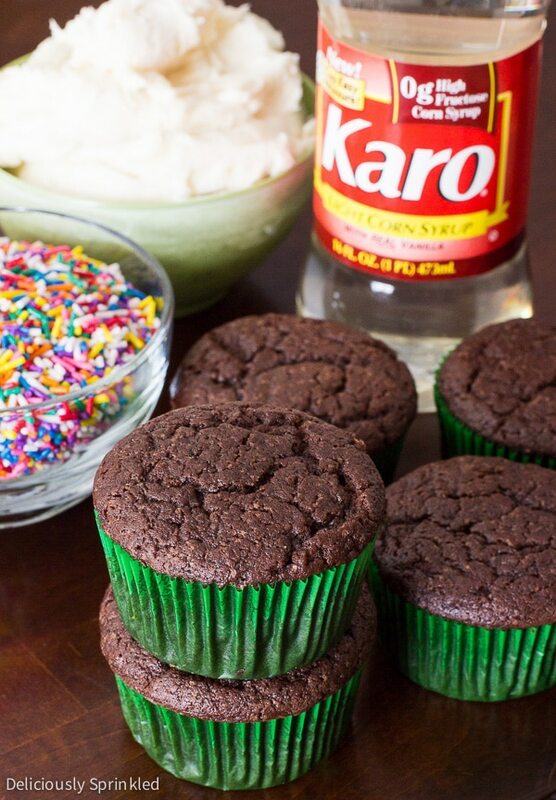 This recipe for Classic Chocolate Cupcakes with Vanilla Frosting is brought to you by Karo® Syrup. When it comes to classic desserts, one of my favorites is my delicious Classic Chocolate Cupcakes with Vanilla Frosting. Don’t be fooled by how simple these chocolate cupcakes are, because I guarantee that once you make them they will be your go-to chocolate cupcake recipe. And of course they are topped with SPRINKLES, which makes them automatically the BEST in my book. These Classic Chocolate Cupcakes are super fudgy, moist chocolate cupcakes that are super easy to make. I topped these cupcakes with the BEST vanilla frosting I have ever made. I used Karo® Light Corn Syrup in the vanilla frosting and let me tell you, it took my original Vanilla Buttercream Frosting to a whole new, amazingly delicious level. 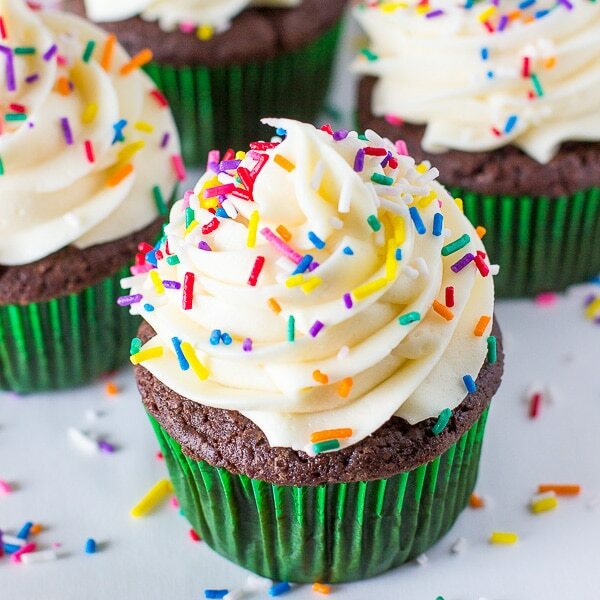 Seriously, these cupcakes taste like you got them from a bakery but they’re even better! Spring will be in bloom any day now, and Easter is inching closer on the calendar! Are you entertaining at all for the holiday or bringing a dish? Dress up these cupcakes in their colorful Easter Sunday best. They’re almost too cute to eat. Almost. ✔ Don’t be alarmed by how THICK the chocolate cupcake batter is, it’s suppose to be THICK. That’s what makes these chocolate cupcakes the BEST! ✔ I like to use an ice cream scooper to fill the cupcake batter into each cupcake tin. I think it makes it super easy and you know that each cupcake will be the same size. ✔ For the vanilla frosting, I highly recommend using heavy whipping cream or half and half because it gives the frosting it’s creamy texture. If you don’t have heavy whipping cream or half and half you could use milk but just know that the frosting might not be as creamy. PRE-STEP: Preheat oven to 350F degrees. Line (1) cupcake pan with 12 cupcake liners. Set aside. STEP 1: In a medium bowl, mix flour, unsweetened cocoa powder, baking powder, baking soda and salt. Set aside. STEP 2: In a large bowl, using an electric or stand mixer on medium speed, beat eggs and sugar for about 2 minutes, or until light and creamy. STEP 3: Add the butter and vanilla extract and beat on low speed for about 1 minute, or until well blended. STEP 4: Beat in the dry ingredients on low speed until blended. DO NOT OVER MIX! STEP 5: Add the sour cream and beat until smooth. STEP 7: Using an electric or stand mixer, cream together butter, corn syrup, and vanilla extract until light and fluffy. Beat for about 3 minutes. STEP 8: Slowly, add powdered sugar and heavy whipping cream. Mix until frosting becomes light and fluffy, adding milk until the mixture reaches desired consistency. STEP 9: Frost cooled cupcakes using a piping bag or knife. Top with SPRINKLES. *For the frosting, heavy cream or half-and-half will give your frosting the creamiest texture. You may use milk instead, but the frosting won't be as creamy. This is a sponsored post in partnership with ACH Brands. I’m thrilled to be partnering with them as a Become A Better Baker Ambassador to share some of my favorite baking recipes. All opinions are my own as always. Thanks for supporting the brands that help make Deliciously Sprinkled possible! Recipe looks amazing! I can’t wait to try it. Question though: Is there a substitute for Sour cream? We don’t have that where I come from. And can I use Vanilla Beans for the frosting instead of the extract? and how much? Does it still work? You never cease to impress me, Jenn! These are some gorgeous cupcakes!!! As always, these are absolutely stunning, Jenn! Pinned! There is nothing better than a yummy classic recipe to always come back to… these cupcakes look soo addicting and delicious! I’m obsessed! Great post, Jenn! The cupcakes look great, and I always love your helpful tips. These look like heaven in a cup! Nothing better than a perfect chocolate cupcake topped with delicious frosting! 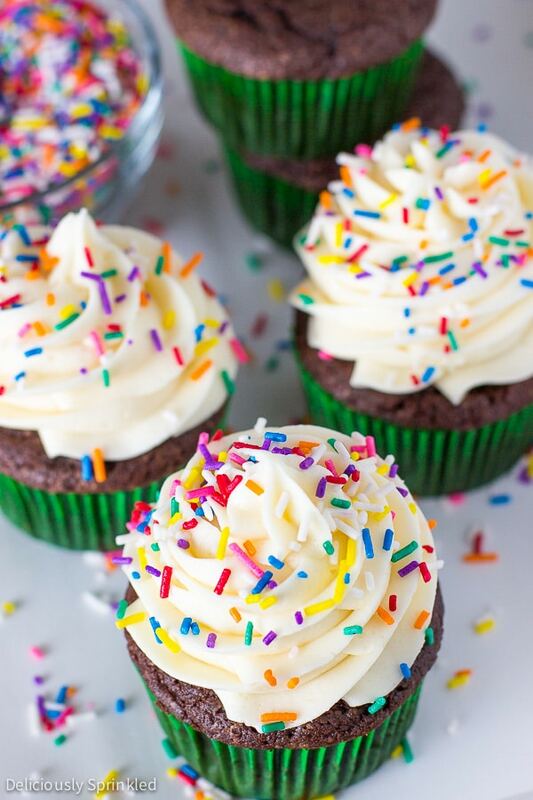 You definitely have got me craving a cupcake right now.. these little chocolate cupcakes look so delicious! Jen, teach me how to pipe frosting!! I’m trying it out tomorrow! 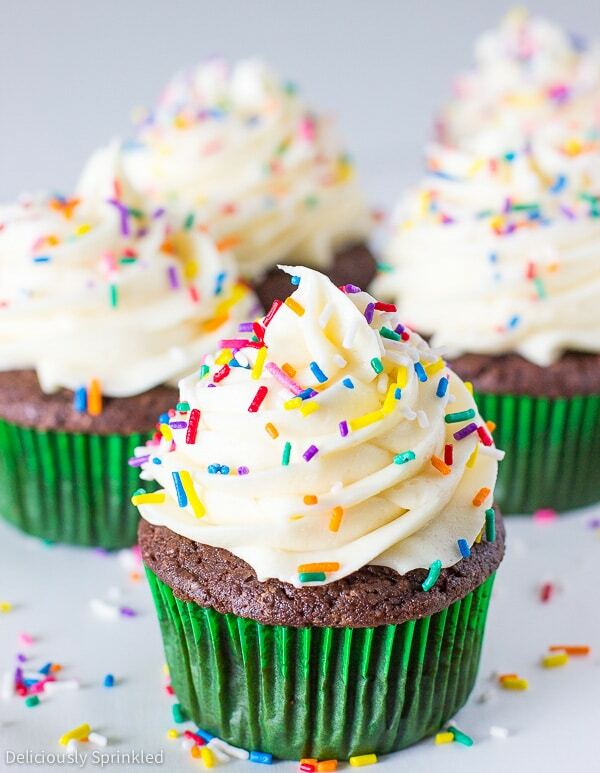 Chocolate cake with vanilla frosting is clearly the best cupcake combination out there. Thanks for posting! Who needs a bakery? Jenn, these look absolutely divine! Just beautiful!! I love a good classic cupcake and chocolate is my favorite! These truly are the most beautiful cupcakes I have ever seen! Funny you mention the thick batter, I always have to tell people not to worry that my chocolate cupcake batter is so thin! Holy Moly! These cupcakes look beautiful and I bet they taste amazing. My boyfriend loves rainbow jimmies on ice cream and cake. I’ll have to surprise him with a batch of these this weekend.